Naoko's Journal: New Year's Eve!! We went to nearby shops to look at things that are not needed immediately. We went to an electronics store, tried an electro massage machine (so comfortable!! ), look around PCs, cameras, MP3 players, telephones, TVs, and so on. We bought nothing there. And then we went an Ramen(a kind of noodle) restaurant for lunch. This is Takoyaki. 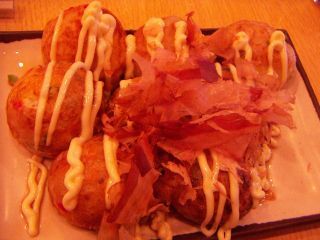 Takoyaki is one of the Osaka's local dishes. If you have chance to come to Osaka, you should try it! 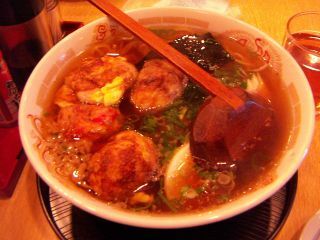 Here is Takoyaki Ramen. It was yummy! After lunch, it's time for dessert!! 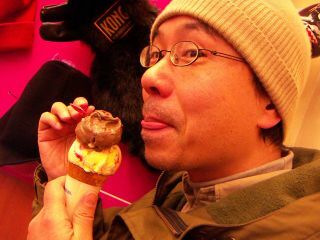 We ate ice creams at the 31 ice cream shop. Takao tried "Rocky Road" and "Banana and Strawberry" tastes. Forgive him for his stubble! 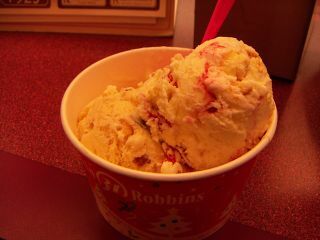 And I ate "Strawberry Cheese Cake" and "Nuts for You" tastes. We have only 6 hours till New Year!! We are going to watch Red and White Singing Contest on NHK, which is the most popular program among Japanese people for New Year's Eve night.